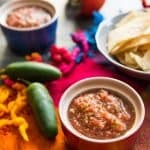 This easy Mexican Restaurant-Style Salsa comes together super fast and has the most amazing flavor! Plus, you can make it thicker or thinner, or spicy or mild, depending on your preference. Never buy store-bought salsa again! Add all of the ingredients into a food processor and process until you reach your desired consistency. My favorite restaurant salsas tend to be less chunky so I pulse a few times to break things up, then process for 10-15 seconds until there aren't any large chunks but stopping before turning everything into a soup. Taste the salsa and adjust as necessary. You may prefer more lime juice or a bit more salt (different brands of tomatoes have different salt content so depending on which brand you are using, you might even need to add another 1/2 teaspoon of salt, which might seem like a lot - that's why it's important to taste and adjust and I always start on the lower end and work my way up). If you want more heat, add in some of the seeds from your jalapenos (I always start with one jalapeno and then add in the second jalapeno, then some of the seeds if needed to get the heat where I like it since most of the spiciness in the jalapenos is in the seeds themselves). Chill in the fridge for at least 1 hour before serving so the flavors have a chance to really combine. Serve with fresh tortilla chips! Can be stored in the fridge for up to 1 week.